It took me about two days to write this post and the main reason was that, despite the fact that I was remembering mostly everything about our experience there (the food, the beer and the nice atmosphere), I had completely forgotten the name. It took me about two days to write this post and the main reason was that, despite the fact that I was remembering mostly everything about our experience there (the food, the beer and the nice atmosphere), I had completely forgotten the name. I remembered even the location, but not the name (in my defense, I have left the date on the picture so that everybody can see that this happened way back in 2008). So, after looking over several pictures and barely managing to make out the name in one of the window reflections, I found it: Jake’s Grill. the Happy Hour is from 3 pm to 6 pm and after 9.30 pm. 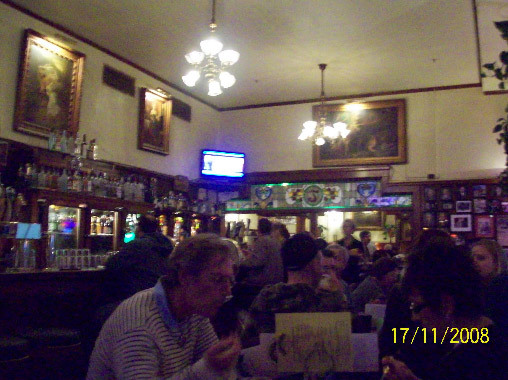 Jake’s Grill (611 Southwest 10th Avenue, Portland, OR) has been purchased by McCormick and Schmick’s, but it has retained its neighborhood charisma and nice atmosphere. We have not tried the regular menu, but the Happy Hour menu was one of the most diverse (food-wise most notably) we had ever tried. Everybody is probably pretty familiar with the Happy Hour food menu: it is either non-existent, with patrons interested only in increasing their volume of drinks sold, or there are only limited options, notably those that can encourage you to consume more beer. This was definitely not the case at Jake’s Grill: the Happy Hour menu abounded in choices ranging from the introductory hummus plate and the prawns and tomato bruschetta (both at $1.95) to the ½ lb Jake’s Cheeseburger ($2.95) and moving into the ‘pricier’ chicken wings ($3.95) or the BBQ chicken pizza ($4.95). You could even try some of the rolls, both as the California and the ahi tuna roll. The complete menu here. Bottom line: good food at Happy Hour prices with the diversity of a regular restaurant and more money to spend on trying some of the local types of beers.